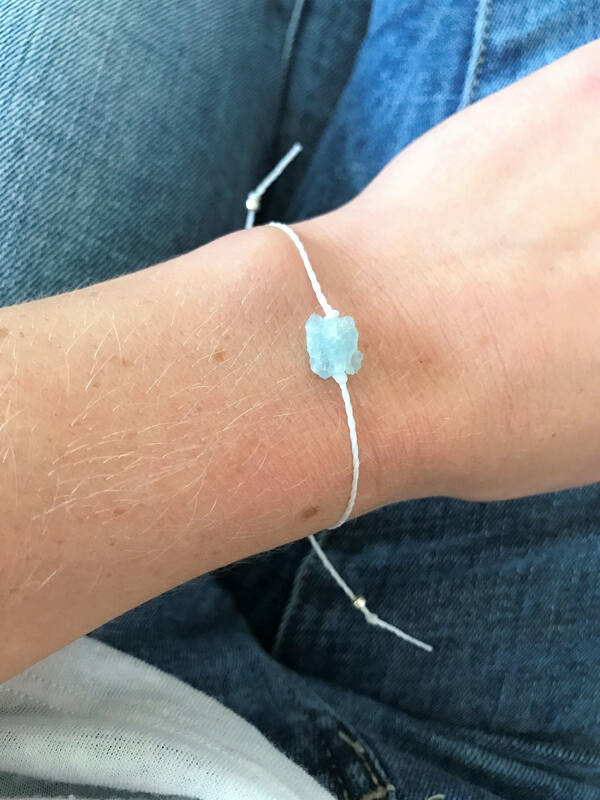 The lovely aquamarine bracelet certainly has charms not to be denied; although the birthstone of March, it will instantly put you in a summer state of mind. When the light catches the stone it glows with a vibrancy and beauty all its own! 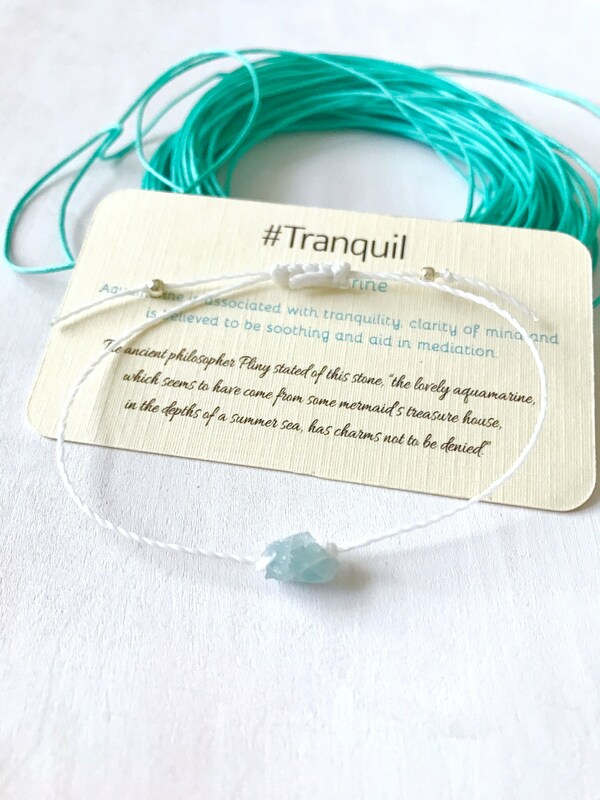 Don't let its beauty fool you though; this delightful bracelet has another purpose besides just being lovely! 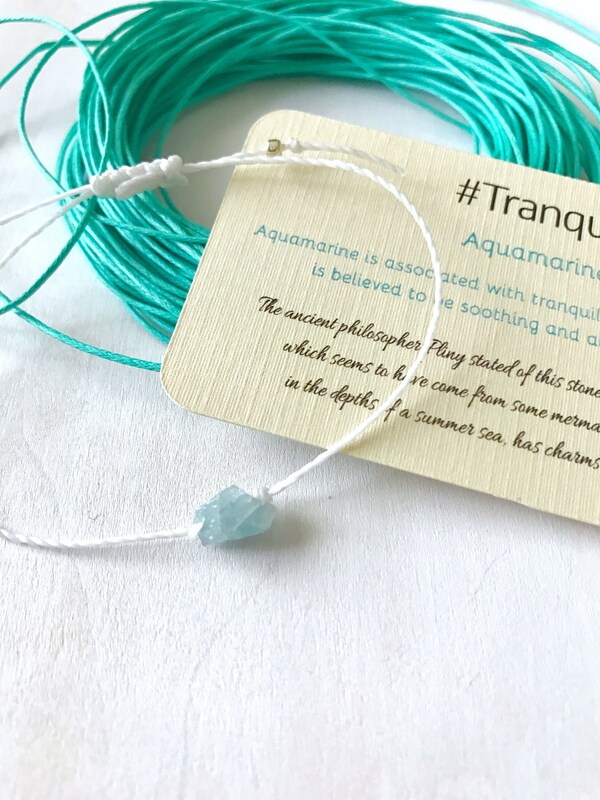 The Aquamarine stone is associated with tranquility, clarity of mind and is believed to be soothing and aid in mediation. 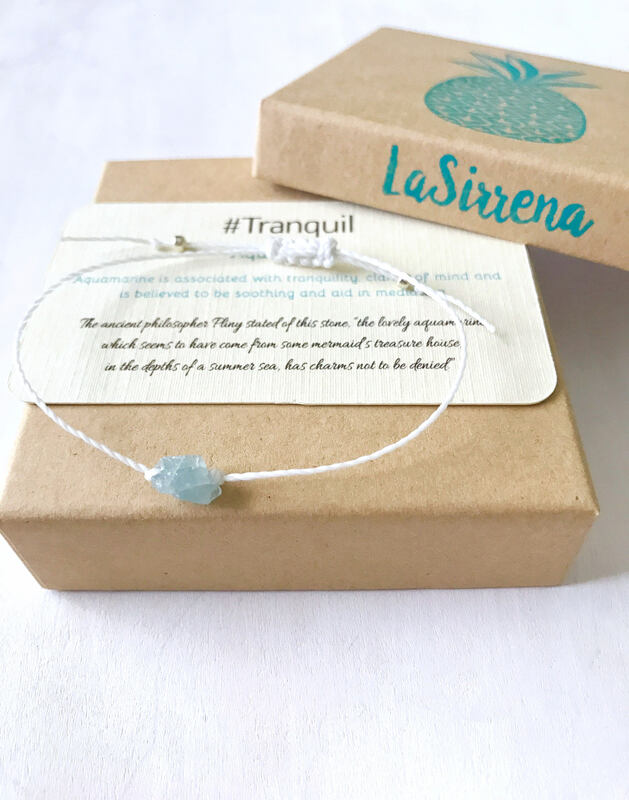 Wearing this bracelet will not only have you turning heads but will also soothe you and keep you tranquil in the midst of those stressed and hectic days. 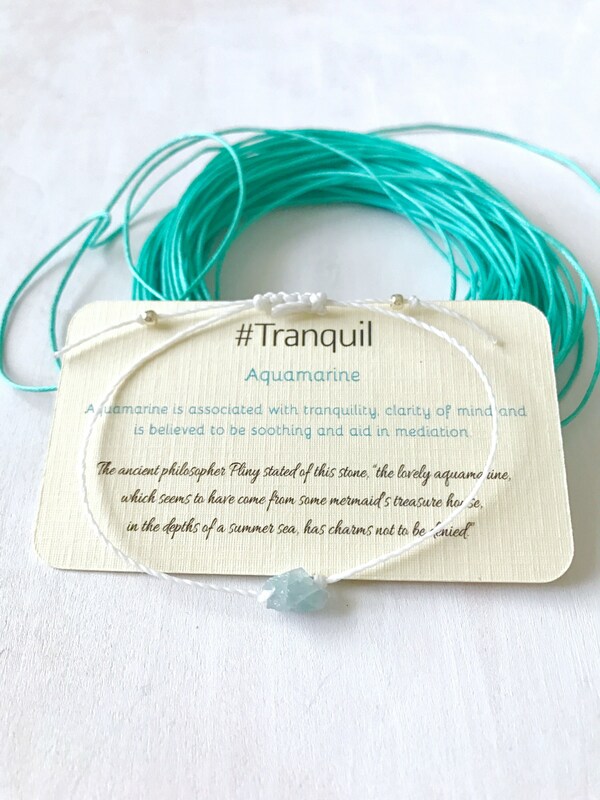 The accompanying #Tranquil card describing the benefits of the Aquamarine stone is an added bonus! 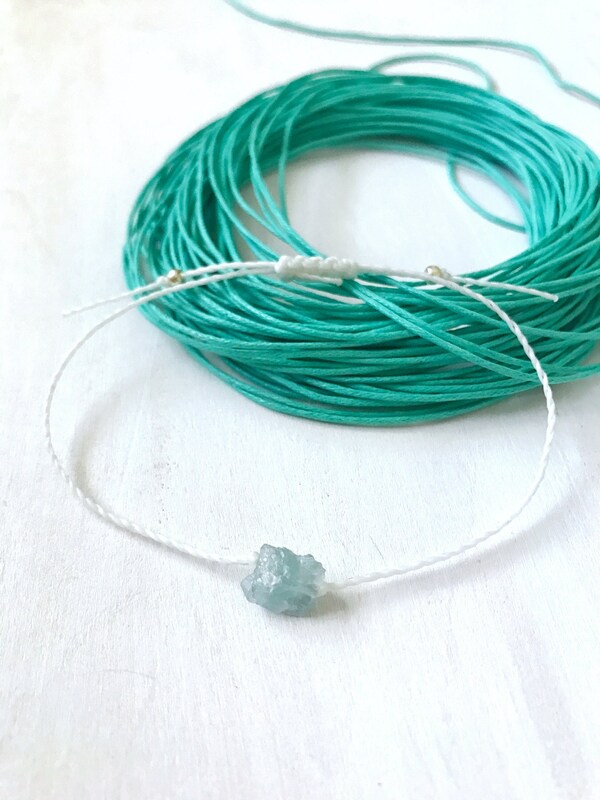 A gorgeously stunning bracelet made out of a mini hand-cut rough Aquamarine nugget stone and white Linhasita thread. The stone is held in place with two knots and ends are closed with two Toho Silver Seed Beads. 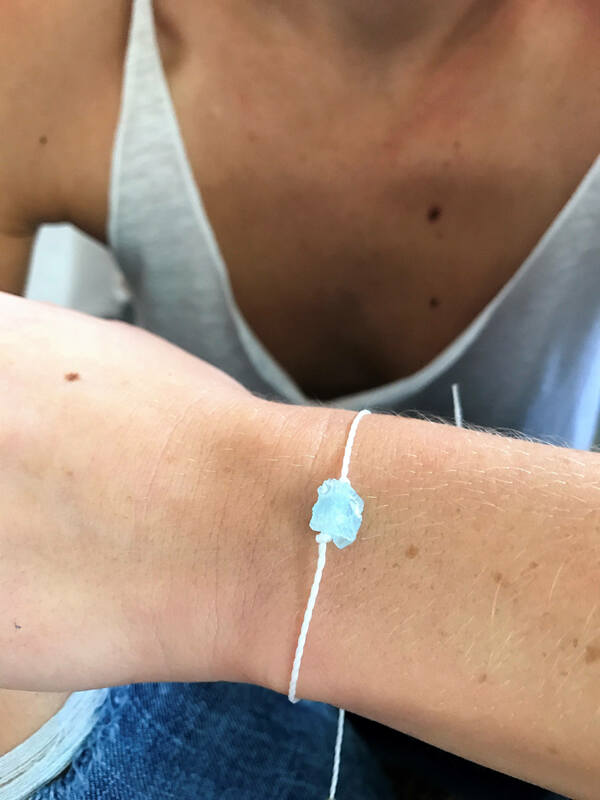 One size fits most - each bracelet is adjustable with a sliding knot closure. *Please note that due to the hand-cut nature of the nugget beads they will vary slightly in color and size. Linhasita thread is a high-quality thread that is waterproof, sturdy, and won’t lose its shape or color after normal wear. 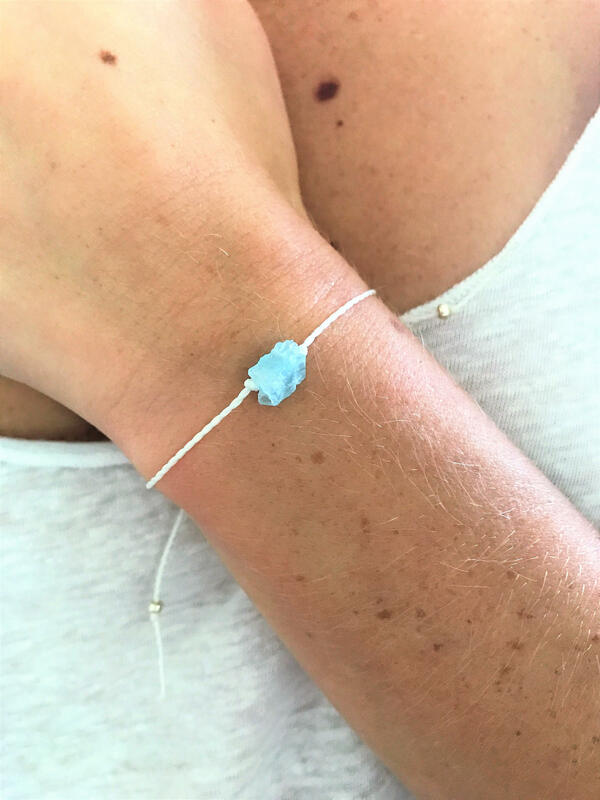 Your Aquamarine nugget is durable but can be sensitive to strong pressure, high temperatures and harsh household chemicals and cleaners so be sure to avoid exposing to harsh household chemicals (bleach, sulfuric acid etc.) and remove before exercising, playing sports or engaging in vigorous household chores. It's absolutely perfect! Just what I was looking for and so pretty! Thank you so much! I stupidly provided the wrong address as this was a gift. They took care of the issue and sent it in a timely manner. My mom loved it. She wears it every day. Thank you for your kindness. Love this bracelet! So simple but still so pretty! I've ordered several of these. Each and every one is unique and beautifully made. I put them on and leave them.